Moving on with the Ghost Ship plans, we have a bunch of enemy ideas we’d like to see in this final ‘true’ dungeon. Some have been planned for a long time – remember the sailors from Merchant Isles with strange hats? They were designed that way specifically so you’d recognize their ghost forms on the ship. So basically, we knew we wanted Merchant Isles sailors in some shape. What we’ll likely do is have weapons (likely swords and such) floating around the rooms in the ‘regular world’. These can attack you, but you won’t be able to defeat them – at best you’ll be able to disable the weapon for a short time – unless you enter the spirit world. 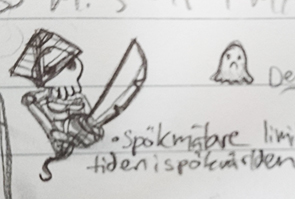 In the spirit world, you’ll notice they are in fact skeleton ghosts holding the weapons, and these fellows you can attack normally. There will be two versions of the sailor enemies – one that does regular attacks and one magician type that buffs enemies or debuffs the players. The buffs/debuffs include making an enemy elite, or cursing the player with Reaper’s Blade (the utility skill also found in the player skill tree). As mentioned, you’ll be able to make the regular attack ghosts lose their weapons a while into combat. If this happens, they will get a skill in which they can dislocate their own skeleton arm and throw at (boomerang-style) at the player, before picking up their weapon again. 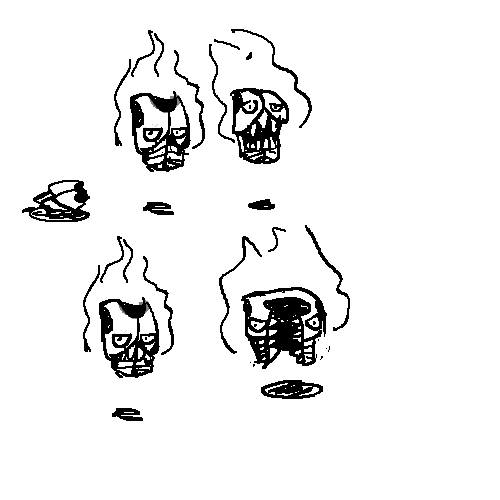 We also wanted a new and more dangerous version of the Ghosties from Pumpkin Woods, only these more dangerous Haunties drip ectoplasm which drains SP while you walk in it – and might also drain the ghost meter which allows you to stay in the spirit world (if we decide to include the meter in the final spirit world design). Finally, since it’s an old ship that has taken in some water here and there, we wanted to include a sea creature of some sort, and right now we’re leaning towards a pretty straight forward hermit crab that will serve as a tanky kind of enemy in the group. 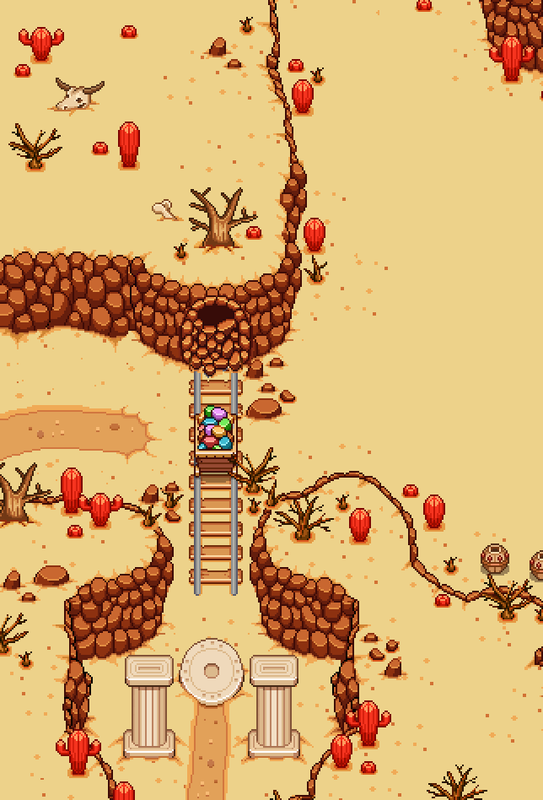 Since we’re still in the middle of the desert, these will probably not be implemented in the near future, and as such it’s possible we’ll change these designs in some ways. At the moment though, we think we’re headed in the right direction, and hopefully it means starting work on the ghost ship enemies will go smoothly once we’re done with the desert areas! 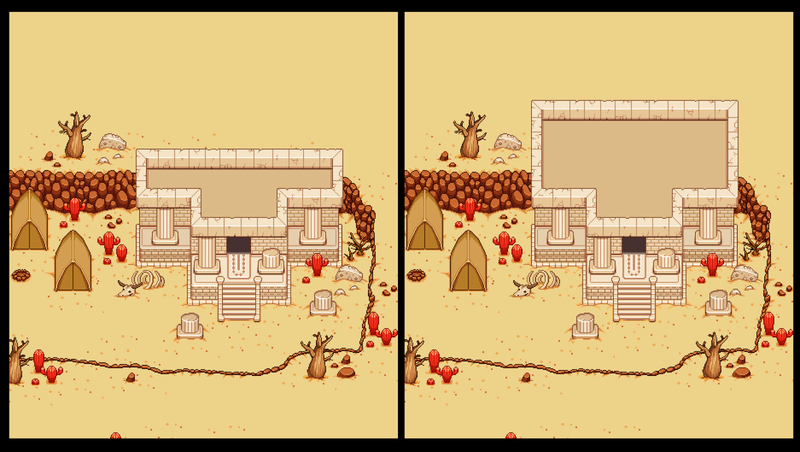 Speaking of the desert, things are still not quite done over there, so over the next couple of days (and lets face it – probably weeks) we’ll work on editing and adding details to improve the overall feel. 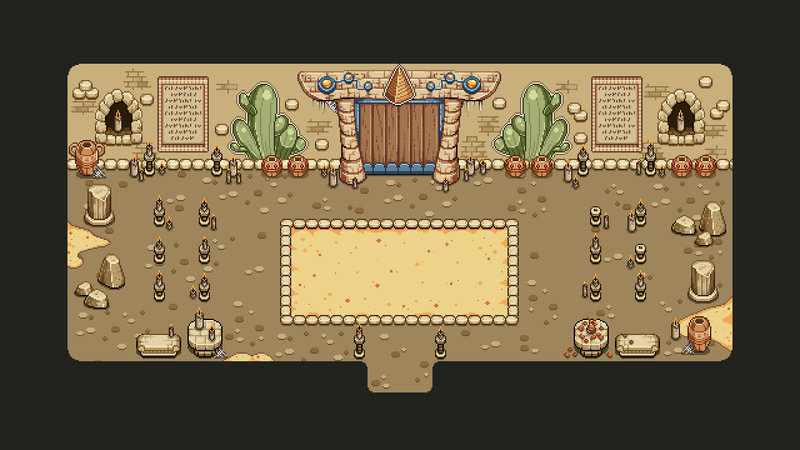 Next, a pretty major change in mechanic when it comes to going from what we call Map03 of the desert, to Map04 where the Saloon and entry to the desert town is. 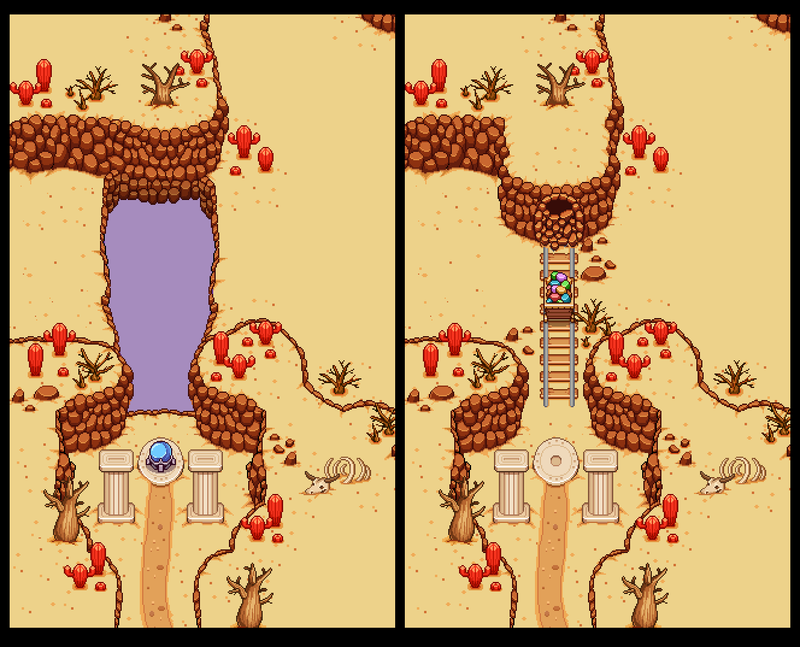 Previously, we wanted the player to use a season orb only accessible through a cave in Map02 in order to get past the water. Since we already used the season orbs once in the area, though, we decided that’s enough, and removed the water altogether! Now your goal is to get there and push a wagon forward and out of the way instead! Which gives an added bonus of being able to go directly to the left into Map04 without having to walk around through Map02 once again! Next, let’s decide on the names for these new couple of areas! 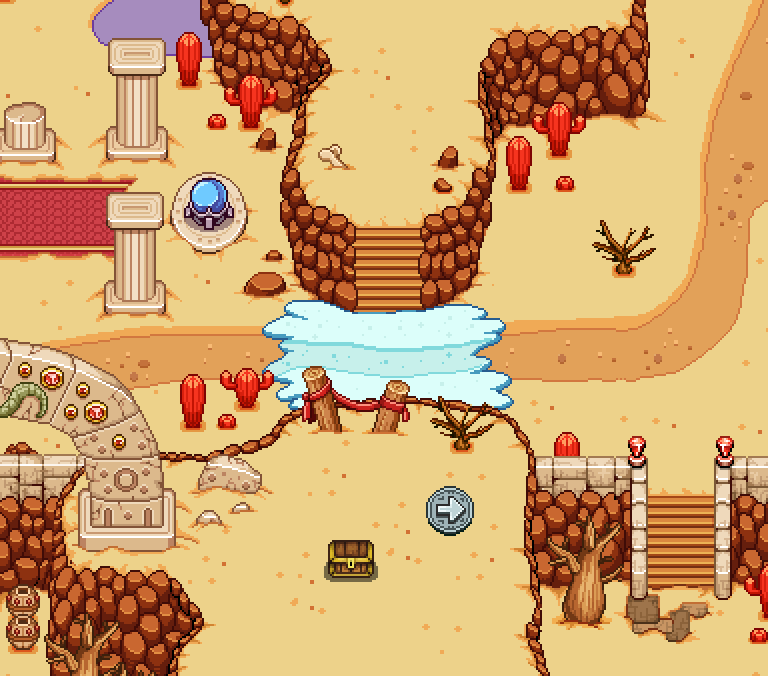 As you might guess, Dragonbone Dunes is the name of the desert, while Port Monnaie is the name of the port town (thanks to Chocodemon for the awesome suggestion). 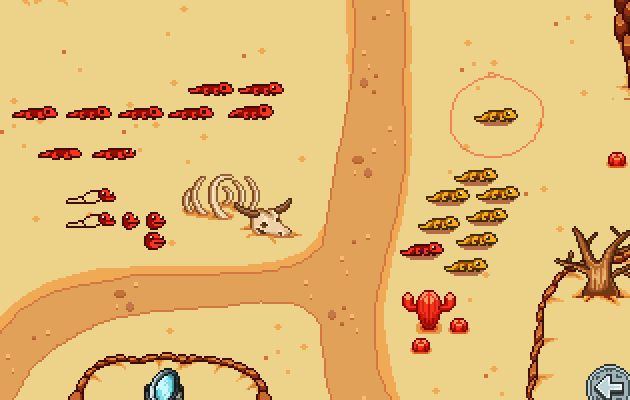 Now, Dragonbone Dunes gets its name from the dragon bones and dragon decorations from Map01, but we will add more dragon decorations here and there in the map to make sure the name ties in well to what you actually see, even if you’re not on the first map anymore. 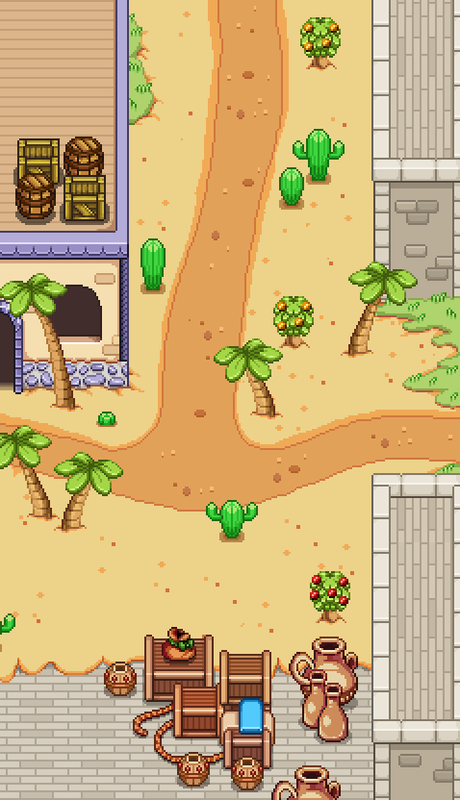 We also realized the path from Map03 to Map04 of the desert didn’t line up quite as well as they could have when zoning from one into the other, so we decided to slightly edit the exit from Map03 to better align with how it looks in Map04. There are still a few portraits left, and this guy seems like he’s relaxing by a table near the beach. What a lovely idea in this hot weather (we’re in the midst of the Swedish summer over here)! 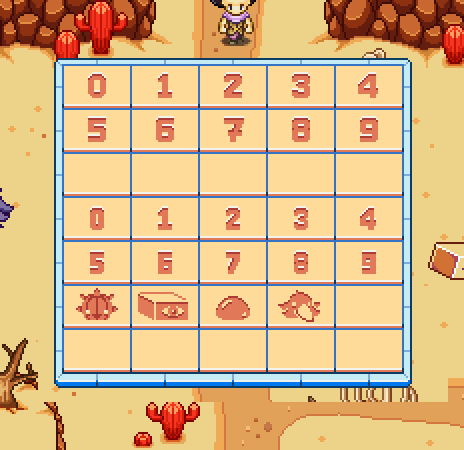 Teddy has started prototyping the puzzle as well, with a few edits compared to what we initially wanted. 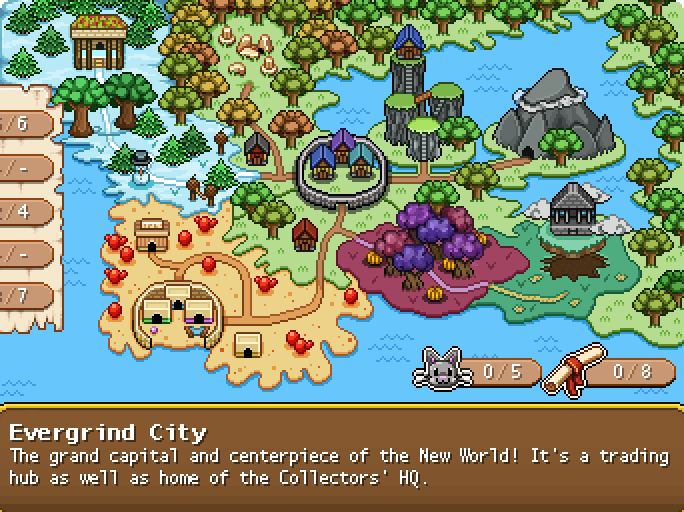 In our first design, we wanted the player to be able to make any path they wanted, however, as we play tested this it felt boring and, honestly, extremely easy. So instead, we made the redesign you can see below – where each of the buttons start inactivated except one, and as you step on it, 1-3 new buttons will activate depending on where you are in the puzzle and which buttons you activated previously. 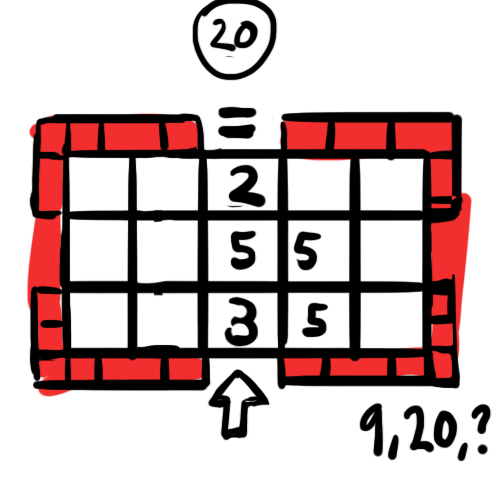 This made for a much more challenging version of the puzzle which we appreciated a lot more! 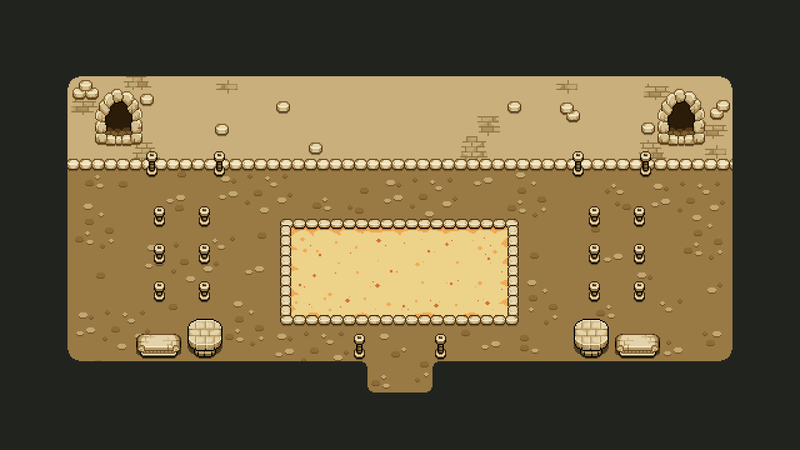 As you can tell, there’s a lot of graphics missing here – such as, you know, the actual caves these puzzles will be in(!) but now that we have a working prototype we can at least be certain that we do like this type of puzzle even outside of the theoretical design (you’d be surprised how many ideas sound great on paper that don’t translate well at all when they’re actually put to the test). Now, next week we’ll actually take a short break to recharge our batteries while the sunlight’s still with us, so the blog will be paused briefly, with new posts returning as usual on Monday the 30th!